Spry Canyon is an exciting and challenging slot canyon to explore. The downclimbing along this route is difficult compared to many of Zion's other slot canyons. 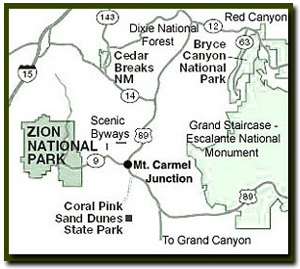 The route begins by hiking into Zion's Upper Pine Creek and climbing up the mountainside, before dropping down into the canyon. At the first of the canyon, there is a drop into a little sandy hole where a wonderful free standing arch is found. The route ends in Pine Creek. Difficulty: Technical canyoneering skills required. This is a drier canyon with more than a dozen rappels that is nice to do in the spring or fall when the other canyons are cold. Equipment: Two 170' ropes, 20' webbing, harness, rappel device, ascending gear, appropriate shoes, helmet and a dry bag. Technical: Several rappels with difficult starts. Longest rappel is 170'. Trail Conditions: Steep slickrock scrambling on the approach and a boulder strewn path on the exit. Off the Beaten Path: Yes, only 12 are allowed in Spry Canyon each day. Best Season: It gets hot in Spry Canyon so many enjoy canyoneering in the spring or fall. Hazards: Low flash flood danger. Water Availability: Bring your own. Restrooms: Restrooms are located at the Canyon Junction parking lot. Southern Utah Flash Flood info. Spry Canyon is a slot canyon and like any slot canyon there is a very real danger from flash flooding. Do not hike this trail if it is raining. Remember a storm far off can trigger a flash flood. Flash flood danger is high. Car Shuttle - Park one vehicle at the Pine Creek bridge and the other at the Canyon Overlook parking lot located on the east side of the Zion Mt. Carmel Tunnel or park at the Canyon Overlook parking lot and hitchhike back to your car after the hike. Walking east from the tunnel, the first drainage to the left is Shelf Canyon. Continue up the road to the next drainage, located .4 miles from the tunnel. This is Upper Pine Creek. Drop down into the sandy bottom of the drainage and hike north for about .5 miles to the waterfall. Just past the waterfall is the best location to climb up (west) the slickrock. Note how the rock curves down, just to the left of the waterfall. Water runs through Pine Creek so prepare to get your feet wet. The Steep Slickrock Scramble Uphill - Pick your way up the weaknesses always being aware of ledge systems that make the travel easier. Soon there is a fairly steep section that wants to draw you to the right, but if you continue up and to the left on the steep slab, the travel soon becomes much easier. You will eventually gain a plateau and much easier traveling as you bear to your right a bit. Aim for a large drainage in the center of what is soon to become a large slickrock basin. Once inside the basin aim for the right (north) side of the basin where you will find ramps that will take you up higher into the basin. From the saddle, travel to the wash below is best done by dropping a 100' to the west, then veering north to get around the right side of a cliff band and then pick your way down the weaknesses to arrive at the wash below. The wash, depending where you enter will eventually take you to the west between East Temple and Twin Brothers. After traveling thru the wide open wash and a bit of bush whacking in the wash for a relatively short distance (.35 miles) you will encounter the first rappel. Spry Canyon Technical Section - Rappelling skills are required to navigate through this slot canyon. Remember slot canyons can change dramatically in a short time due to flash floods and water levels in this canyon change. These directions are only a general reference. Be prepared for variations in the canyon. First Rappel - There is a drilled baby angle and a bolt with hanger on the left side as you work your way down the slickrock. This rappel descends a total of 165' on a low angle sandstone slab. Continue down canyon for another .35 miles. This is where the canyon narrows. Second Rappel - Rappel 20' from a tree on the right side into a narrowing slot below. At the bottom of this short drop there is a very pretty bridge where you can sit and enjoy lunch or a rest. The arch is small but very pretty. Third Rappel - As you stand the next rappel or downclimb is just a few feet away and drops 12' from a root jam into a small pool of water below. This can be a difficult start for many canyoneers. Forth Rappel - Next comes a short downclimb and a couple dry falls that can be skirted on the right side. The next rappel is soon to come down a narrow slit off another root anchor into another pool of water. Fifth Rappel - This rappel offers a challenge and somewhat of problem just to get to the anchors. There is a fluted slit in the sandstone with the 2 bolt anchor located on the right side wall above the drop of 50'. Use caution as you reach to thread the rope thru the anchor. There is a tree set back 25' on the left side to establish an edge line if you don't feel comfortable trying to make the reach across the chasm for the anchor. Sixth Rappel - This obstacle comes soon after and requires that you work your way down the slickrock water course (skirt right around bushes near the top) then about 150' down and across a ledge on the left to a 2 bolt anchor. This drop of about 80' puts you into a particularly pretty slotted section of the canyon. Seventh Rappel - This rappel is 2 stage and 95' and is accomplished from a sling around a large boulder chockstone above your head. Eight Rappel - Another rappel presents itself almost immediately by using a 2 bolt anchor, dropping you 25' into a bowl and then across the bowl to another 10' drop to the wash below. Ninth Rappel - Don't put away the rope yet. You soon come to a bend to the right and a 2 bolt anchor on the right that enables you to descend directly below, 40' into a pool of water, or you may want to use the anchors to protect a traverse down canyon to a sling anchor threaded through an arch on the left wall directly above the slot and a 35' drop to the dry floor and then another 10' into a 20' long, very cold deep wader or swimmer. Tenth Rappel - Once again almost immediately comes another drop (2 bolts) of 65' down a flute into a large sandy bowl below. Eleventh Rappel - From this bowl climb out on the left side to a large ledge and tree anchors to make the last rappel for a while of 70'. Exit Spry Canyon - There is a sign at the bottom of this rappel that asks you to remain in the rocky watercourse to prevent erosion to the hillside on the right and left of the wash. Please abide by this. Its more fun to do some boulder hopping anyway. Twelfth Rappel - Not too far down the boulder wash will come a large cliff band "Lambs Tongue" that provides you with the last and very spectacular rappel of 95' by using a tree anchor. Work your way down the boulder wash towards Pine Creek. At the last cliff band just above Pine Creek, your option of turning right or left becomes apparent and the direction you opt will depend on whether you have parked your shuttle vehicle at the bridge over Pine Creek (easiest exit) or at the switchback (more difficult).